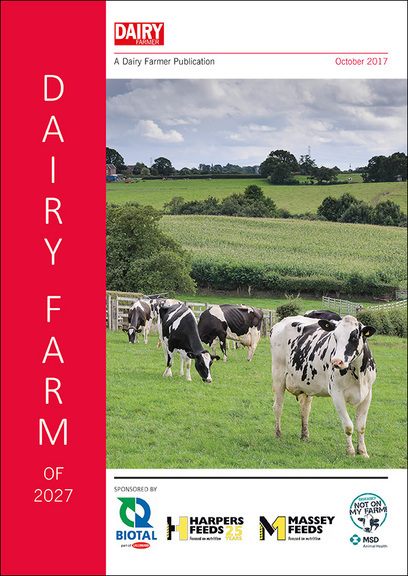 In order to set the foundations for a sustainable business in 2027 and beyond, dairy farmers need to assess their business now and set targets to ensure they are in the top 10% of farms ranked on production from forage You only need to turn to the latest figures from Kingshay Costed herds to see why. For the year to June 2017, the top 10% of herds ranked on milk from forage, yielded 52% milk from forage versus 32% for the average. As a result, they had 1.84ppl less bought-in feed costs and subsequently 1.86ppl more margin over purchased feed compared to the average (see table, p9). So not only are they protecting themselves against volatile feed and milk markets, but also boosting their bottom line. In the future, the development of a new type of forage inoculant will enable farmers to reduce aerobic instability in higher dry matter silages, without having to wait several weeks before opening the clamp. By incorporating the proven strain Lactobacillus buchneri 40788 with the new Lactobacillus hilgardii, clamps can be opened after just 15 days, compared to the usual 45-day minimum. However, if clamps are kept shut, the new combination has been found to give longer aerobic stability versus using buchneri alone. Roy Eastlake, of Biotal, believes milk from forage should be a key focus for all farmers, regardless of total yields. As such, he emphasises the need for a change in mindset among some higher yielding herds which traditionally view high milk from forage as only achievable in herds on the lower end of the yield spectrum. In fact, closer analysis of Kingshay Costed herds clearly illustrate total production does not need to curtail milk from forage. 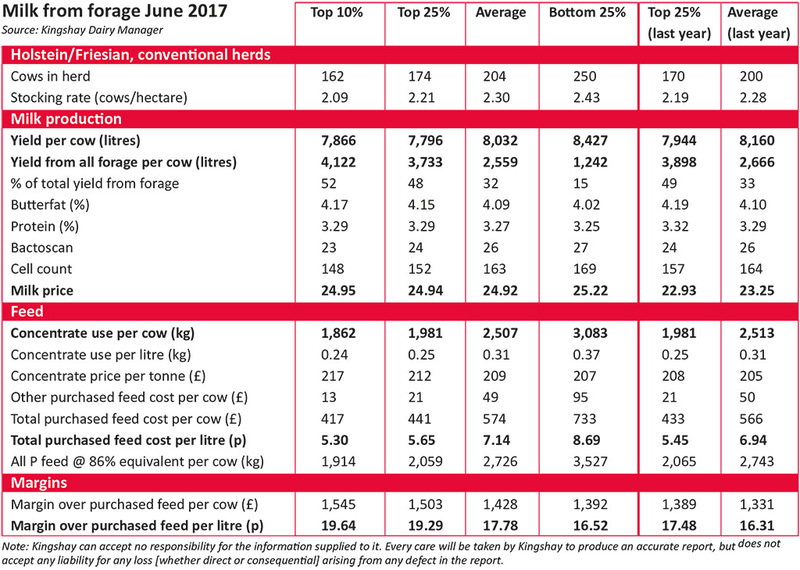 Data to June 2017 shows the top 25% of herds yielding 9,000 to 10,000 litres per cow per year achieved 38% milk from forage. That compares to 27% milk from forage for the bottom 25% of herds yielding under 6,000 litres. Mr Eastlake adds: “If you look to the US, there are herds achieving 13,000-litre herd average by obtaining 60% milk from forage. Quality, digestible forage is key.” University of Wisconsin extension dairy specialist Randy Shaver identified the influence of forage on high-yielding herds in Wisconsin as part of a farm survey carried out in the region. The highest yielding of 15 herds was achieving 63kg of milk per cow per day, with 38kg of that from forage (60%). Dr Shaver concluded feeding high-quality alfalfa and maize silage, which was harvested, stored and preserved to optimise forage digestion was crucial to success. 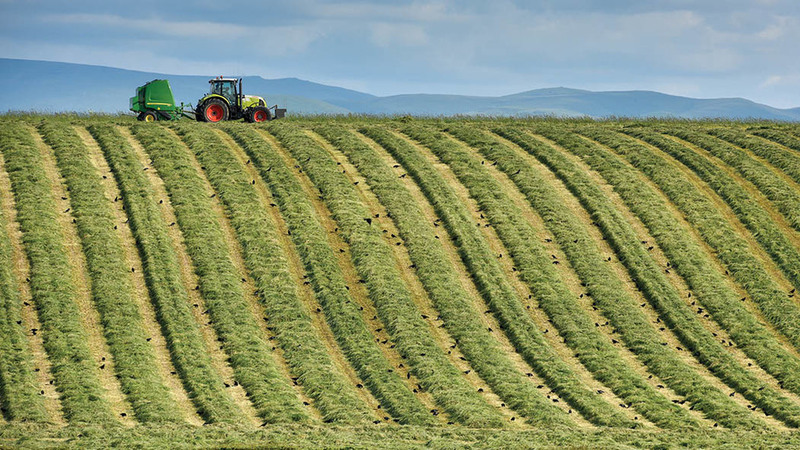 This season’s early first cut silage results from Trouw Nutrition highlight the potential to make quality silage, as well as the huge scope for improvement on many farms. As many chose to cut earlier this year and grass was less mature due to the slow spring, grass averaged 70.6 D value, 11.3ME and 15.3% protein and the top achieved 75.9 D value (see table 2, p10). However, as always there was big variation, with some farm’s silage analysing at 58 D value, 9.3 ME and 8.9% protein. Wastage accounts for 27% of grass silage losses on some farms with about 15% lost at harvest, 7% in the clamp and 5% from the clamp to feed out. “The average farm loses 20%, so that’s one-in-five trailers which you’re happy to put on the muck heap. On some farms I’ve seen much worse, with 50% thrown away on some clamps,” he says. Reducing wastage can save about £7.50 per tonne of dry matter or more than £2.25/t fresh weight. To avoid wastage, an oxygen barrier film could be used on the top of the clamp to exclude air. In a clamp with a 125 micron plastic sheet and tyres, typical losses in the top 1m can be about 20%. By using an effective oxygen barrier this can be reduced to less than 10%. By cutting earlier, there is the potential to increase first cut grass silage quality by around 0.5MJ/kg DM, as shown in the year’s silage results. First cut yields may be slightly lower, but second cut will be larger and quality over the season will be better. Increase milk yield by 0.9kg/cow. However, as a result of lower fibre grass silage, there is the risk of splitting in the clamp. As a result, Mr Eastlake advises opting for smaller, lower clamps when adopting such a system. Timing of nitrogen application also needs to be considered carefully on multi-cut systems and is an area where farmers commonly become unstuck. As the gap between cuts is smaller, so is the potential for nitrogen uptake by the plant. There needs to be less than 100mg/kg DM of nitrate in grass at silage otherwise there can be issues with wastage in the clamp due to fermentation challenges. Analyse slurries and farmyard manures so you know exactly what you are applying and you can plan how long it will take for nitrate to be absorbed. Plan nitrogen applications for the season. Apply fertiliser little and often. To ensure nitrates have been taken up by grass sufficiently before ensiling, a sample of fresh grass can be collected from various points in a field pre-harvest, pressed in a garlic press and the liquid tested using an indicator strip (about £30 for 25 tests). Grass can be wilted longer to reduce impact of nitrate on fermentation process. A crop-specific silage inoculant of homo-fermentative bacteria can be used to help drop the pH rapidly. Silaging can be delayed and grass retested in a few days. Testing fresh grass for sugar levels using a refractometer (about £30) in a similar way to testing immunoglobulins in colostrum needs to become the norm in order to maximise fermentation success and silage quality. Sugars are the driving force behind fermentation so are essential to achieve a rapid drop in pH in the clamp and an efficient silaging process. In a similar way to testing nitrates, fresh grass ‘juice’ can be observed on the refractometer prism to give an idea of grass sugar levels. A Brix reading of around five says there are enough sugars for ensiling. If the sugars are not there and there is only a small weather window, an enzyme inoculant could be used to boost levels by up to 3%.